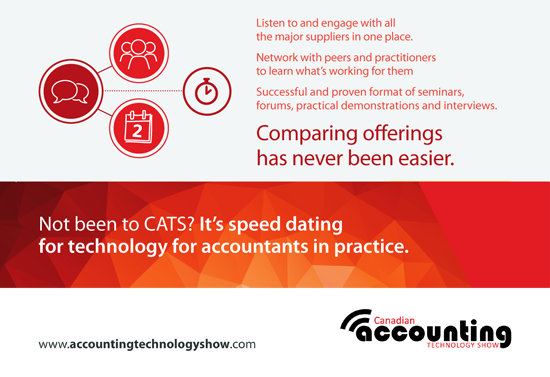 As a proud sponsor, we’re offering our contacts a 15% discount* off your full two day attendance to CATS 2016. Use the online registration form, and enter the 3 letter code: JAZ at the beginning of the registration process in the ID Code area. Jazzit has released an update for Jazzit Fundamentals on February 26, 2015. 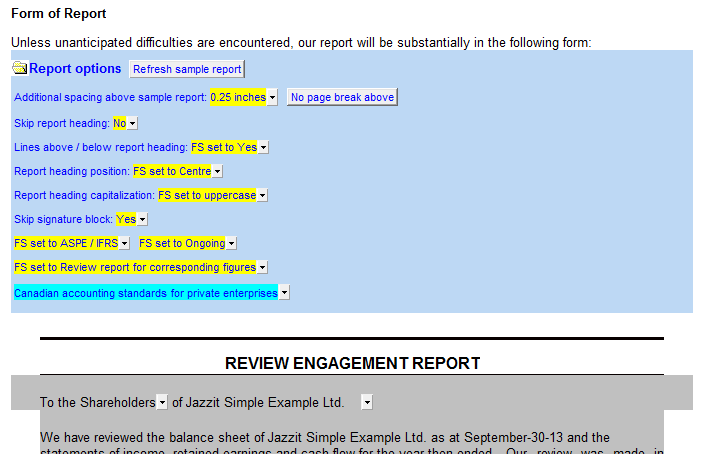 Administrators please click on the link for the log of revisions: Jazzit Fundamentals Update Log. Also check out our new video on "Notes menu options in the financial statements". The template has been redesigned for better internal use and external presentation. 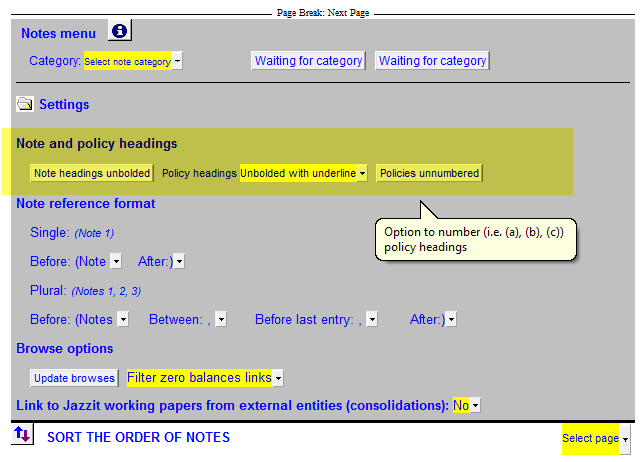 View the template as either a “working paper” or “client version”. While in “working paper” view all the information you can expect to put into a working paper, such as mapping references, annotations, document sign-off and more, are automatically set to print. When set to “client version”, the previously mentioned information is automatically set to skip allowing for a cleaner presentation ready to be handed to your clients. Support for up to 5 years with dollar and percent variances, together with vertical dividers between the years. Ability to print in either legal or letter, and in landscape or portrait (NOTE: a limit of 6 columns is recommended in portrait/letter mode and 10 columns in landscape/letter mode, any more will require a combination of landscape and legal to be used). 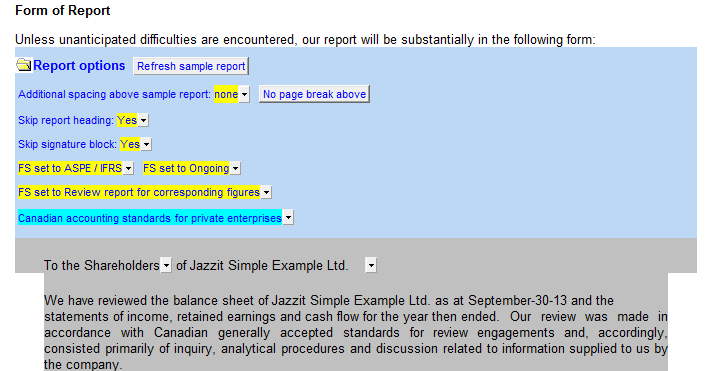 With the start of a new year, comes the refreshed Jazzit SCORE template with new features and enhanced functionality. SCORE allows you to provide your clients with valuable information regarding their business, through ratio and trend analysis as well as custom benchmarking information, either as a stand-alone service or a value add in addition to other services provided by your firm. Adding letterhead and/or electronic signatures to SCORE? Follow the link to our community post on how to insert them into your SCORE template! Jazzit has released an update for Jazzit Fundamentals on January 29, 2016. Introducing Jazzit Webinars! A convenient online way to learn more about your Jazzit package. Check dates and register here! Jazzit has released an update for Jazzit Fundamentals on November 27, 2015. Introducing Jazzit Webinars! 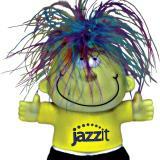 A fun and easy online way to learn more about your Jazzit package. Check dates and register here! Also check out our new video on "How to import Excel objects into the Jazzit Templates". Jazzit has released an update for Jazzit Fundamentals on October 30, 2015. Also check out our new video on "How do Windows regional settings affect the Jazzit Templates?". 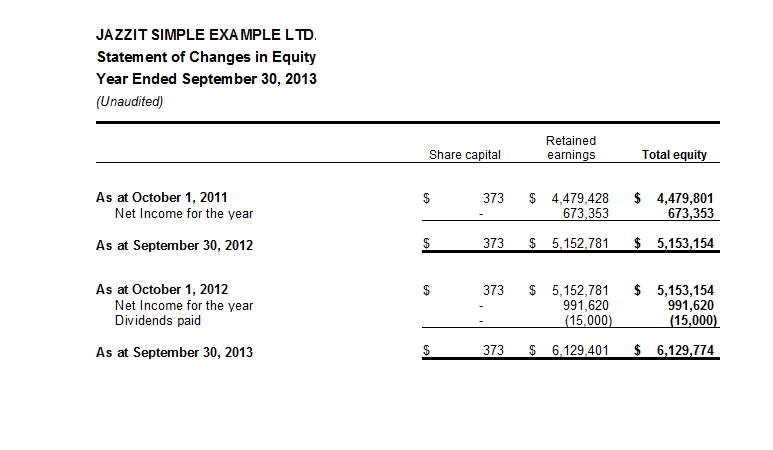 We have added the statement of changes in equity to the financial statements. The statement can be used as an alternative to the statement of retained earnings, and provides columns for accounts such as share capital, accumulated comprehensive income, and minority interest. 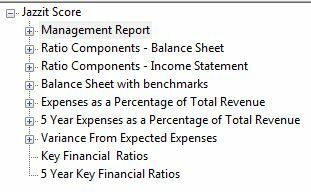 Note: This statement is selected from a dropdown in the statement of retained earnings ONLY when using the 9 column financial statements and the structure is set to a limited company. This statement also requires additional style sheets and database files updated in the Resource Centre before use. - When connected to an update folder, the JZUPDATE will now display which build version is located in the update folder. - The status column will no longer display a warning if the module in the current Resource Centre is newer than the update folder. Added the ability to delete multiple rows in multiple tables throughout the working paper, similar to how multiple rows are inserted in the working papers, under the document option settings. Headings can now be shown in italics (with/without underlining and bolding). Note now supports the ability to display as many related parties as required. Please see the first three related parties already inserted for guidance on how to create more. The statement of changes in net assets now supports the ability to disclose prior period adjustments the same way the statement of retained earnings does. - GST tax - Added wording for electronically filed. - Government of Canada direct deposit - Added a paragraph with wording indicating a switch to electronic filing of returns, and information on registration for the process. The engagement report heading can now be set to left, centre, or right aligned and the case can be in either upper or lower via the report options, found at the top of the report. The heading for the report can now be set to left, centre, or right and the case can be in either upper or lower via the management responsibility options, found at the top of the report. - The page title case for the engagement report is now linked to what has been selected in the engagement report options below. 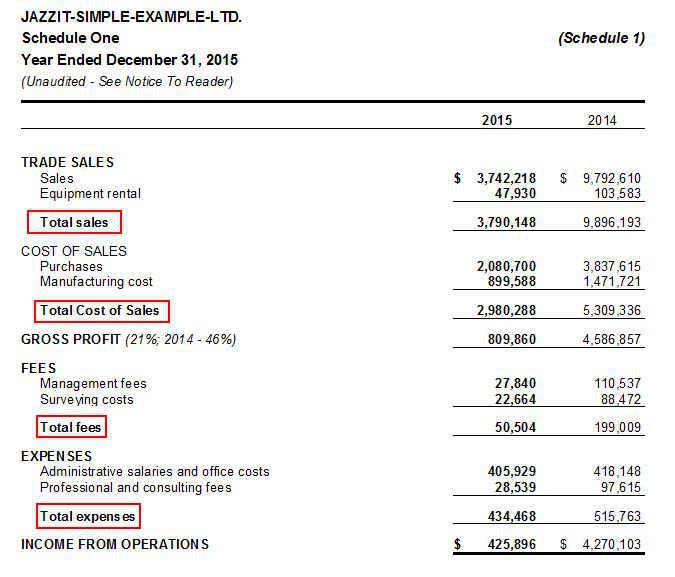 - The word "Financial Statements" can now be set to upper or lower case. 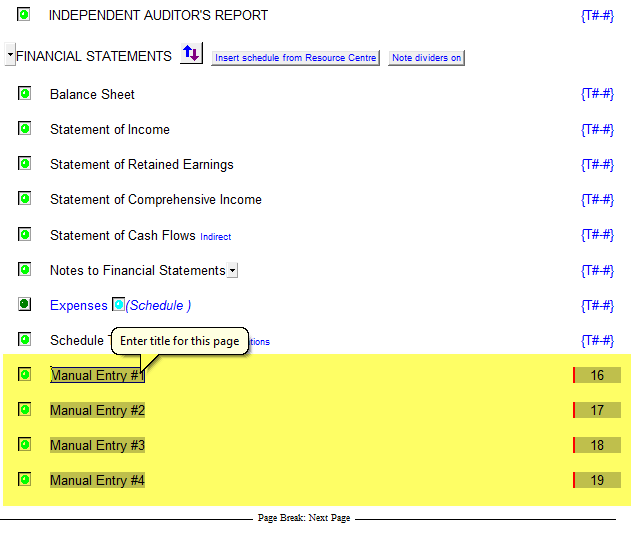 - The word "Financial Statements" can now be turned off if required. Calculations of posting threshold - Section has been added back to the template and enhanced. 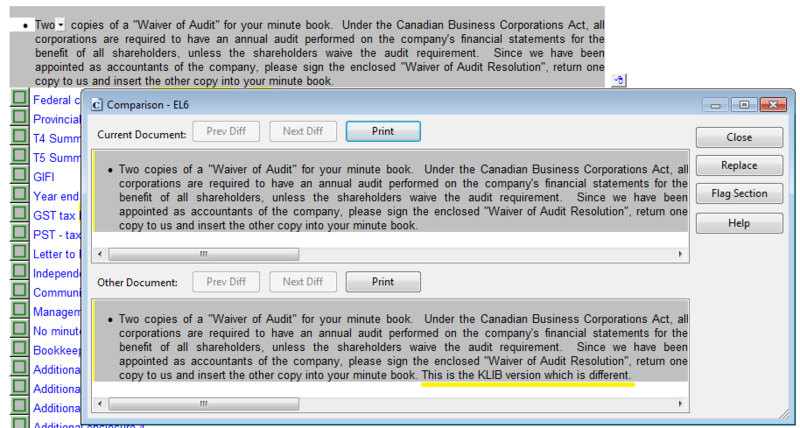 - The headings (including page title, signature boxes, and index number) for the statement can now be turned off if required. - Other minor visual changes have been tweaked. The "Other deduction 1/2/3/4" columns can now be turned off and have their headings adjusted via settings in the salary reconciliation options. 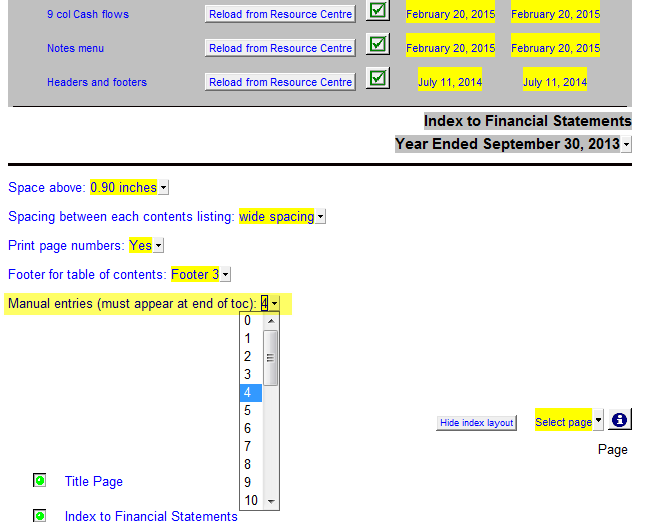 The Status column, located under Admin, will no longer display a warning if the module in the financial statements is newer than the Resource Centre. The share capital section will now retain details for authorized and issued shares even after updated the balance sheet from the Resource Centre. The estimated tax savings calculation has been adjusted to use the ending loss carry forward balance instead of the opening balance. We hope you enjoy the improvements to Jazzit Fundamentals! 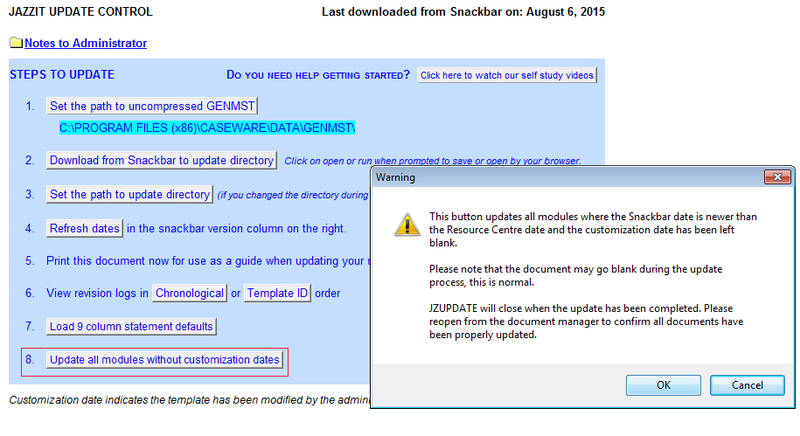 Jazzit has released an update for Jazzit Fundamentals on September 25, 2015. Make sure to check out our new Jazzit Support Centre! Also check out our new video on "Draft Statements Based On Mapping". 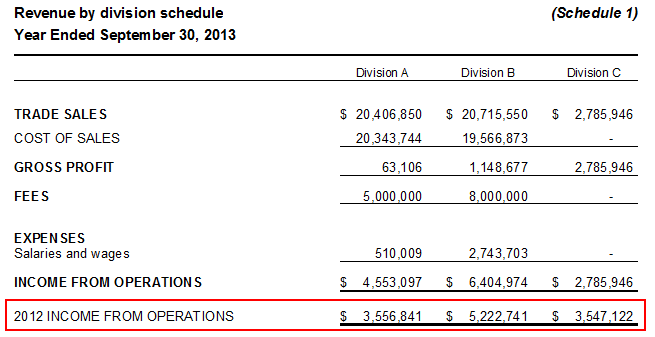 We've created a statement of net worth for director's/members/owners. 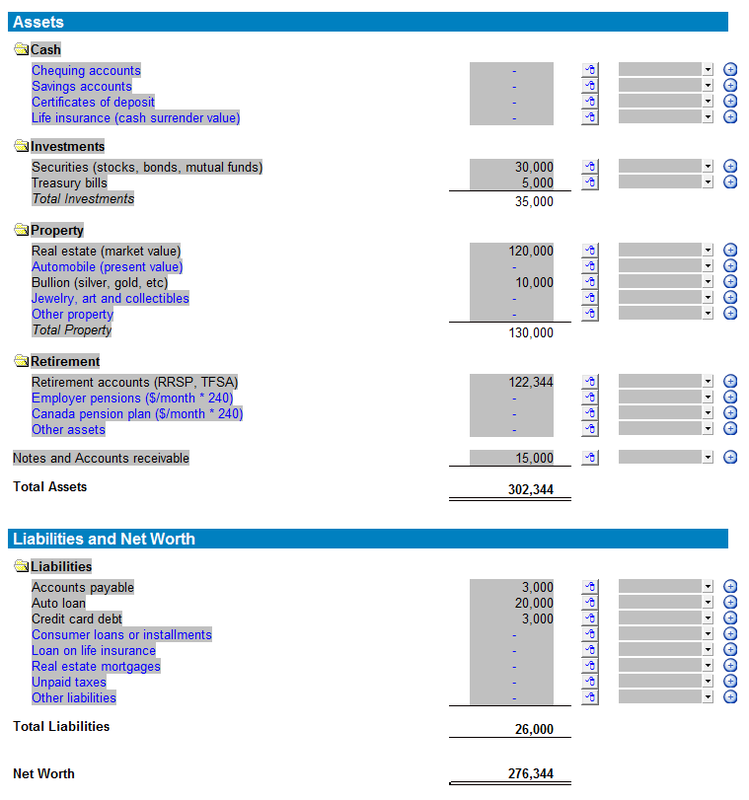 This document can be used as an additional working paper to summarize their net worth. NOTE: This document is manual and does not link to any trial balance information. We have added a new optional step in the update process. Using the "Update all modules without customization dates" button will update ALL modules in the KLIB which have newer versions in the relevant update folder. This process should take a few seconds to complete and will not update any modules which have a customization date associated to them. We have added a support button in the upper right hand corner, with links to support and user resource channels. The KLIB path can now be set by simply double clicking the director location and navigating to the desired folder. You are now able to adjust the spacing on the Title Page on individual files. Selecting the Title Page, opening the "Title page settings" folder in the financial statements will allow the user to adjust the spacing of the wording on individual files if necessary. NOTE: The KLIB functionality for administrators remains the same if you wish to set firm-wide standards for spacing on the Title Page. We have added the ability to include a second description column, with note references, to each section via the right-click express button menu option. 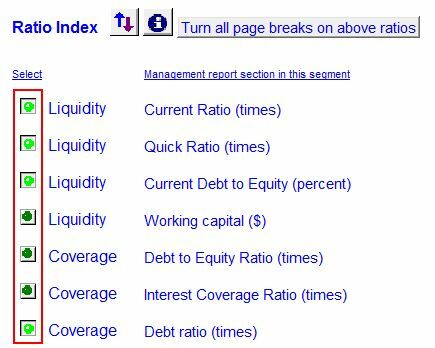 We have added the option to select descriptions for Total Assets, Total Liabilities, and Equity. We have added an extra column which shows the number of lines in a specific group, including a tool tip in the description column. 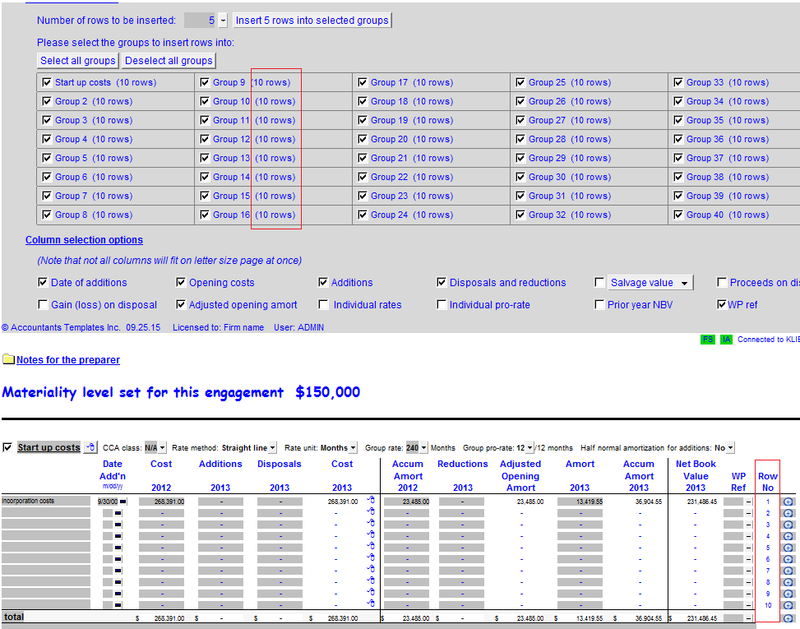 The number of lines in a specific group has also been added to the Global row insertion section. This row number column is optional and can be turned off under the Column selection options. 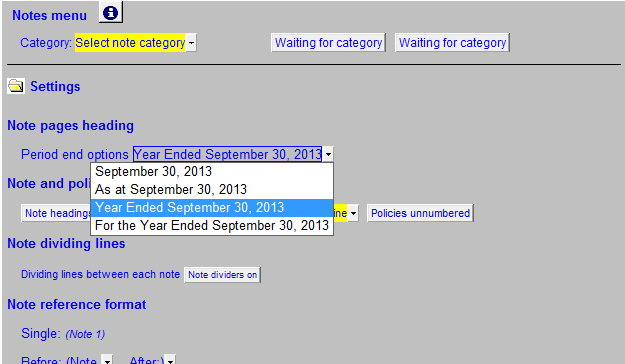 Added current and prior year end date selectors to the document options. "Summary of corporate taxes payable (receivable)" now supports up to four columns for displaying taxes split across different levels, i.e. federal, provincial, municipal, etc. Review/Notice to Reader - Updated to the latest September 2015 wording as provided by CPA Canada. Notice to Reader - Added the option to have an engagement letter for a corporate tax return only (no financial statement compilation). This option is only available if the type of engagement is set to Notice to Reader. Notice to Reader - The last line of the engagement letter for Notice to Reader has been made consistent with that found in the Audit and Review options. We have expanded the number and combination of salutations available under the "Attention:" and "Dear" drop downs. Updated to the latest CPEM and PPM wording. Notice to Reader - Added the option to have a representation letter for a corporate tax return only (no financial statement compilation). Added additional subtotals including lines 113A, 113B, and 113C from the quick method GST/HST form. 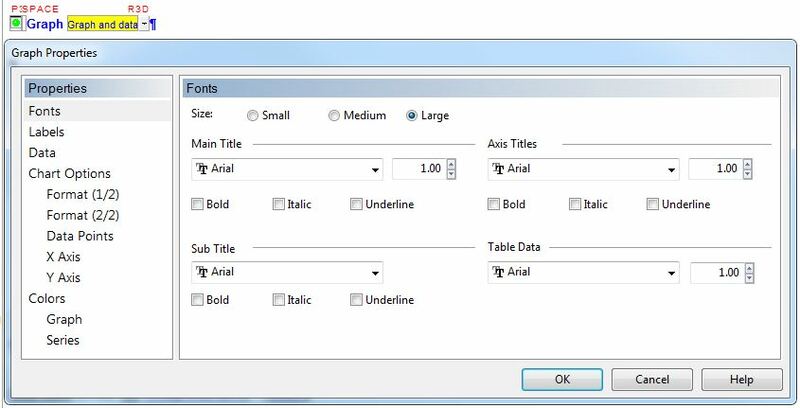 We have added the option to print or skip the column headings for each of the 5 sections. We have added functionality similar to that found in the Client Enclosure Letter whereby individual lines can be set to skip/print and updated from the Resource Centre module using the right-click express button options. We have added the ability to include loans/leases which start after the fiscal year end. Increased the number of related party groups from 15 to 20. View the CPEM Audit log HERE. View the CPEM Review log HERE. If you require assistance in updating your Jazzit Checklists please view our Checklist Getting Started Guide. Jazzit has released an update for Jazzit Fundamentals on July 31, 2015. 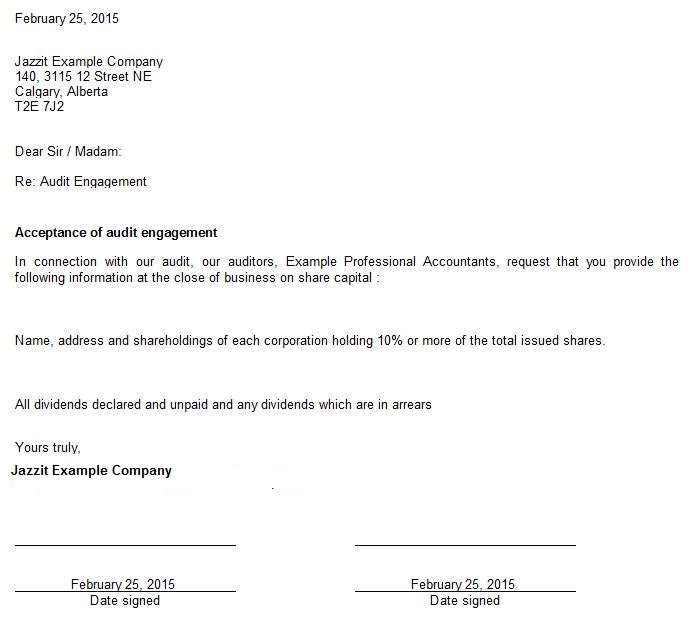 Also check out our new video on the Jazzit Financial Statements Home Menu! Added a new section in the template options that allows the user to insert a desired number of rows into selected or all groups. 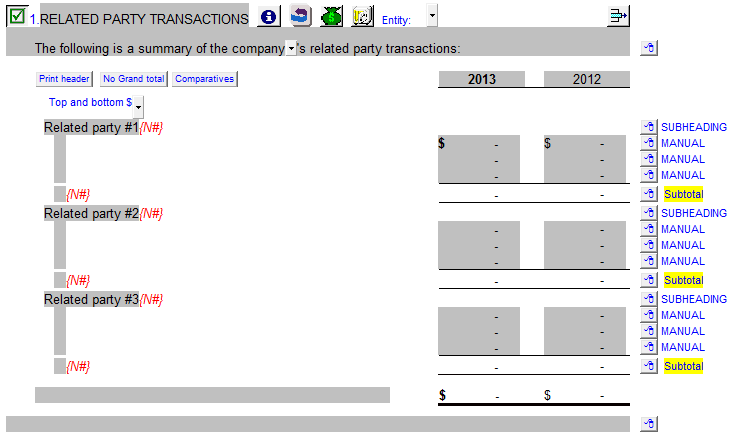 Added "Preliminary" and "Final" columns to the table of financial ratios. Added rounding threshold information into the rounding section. 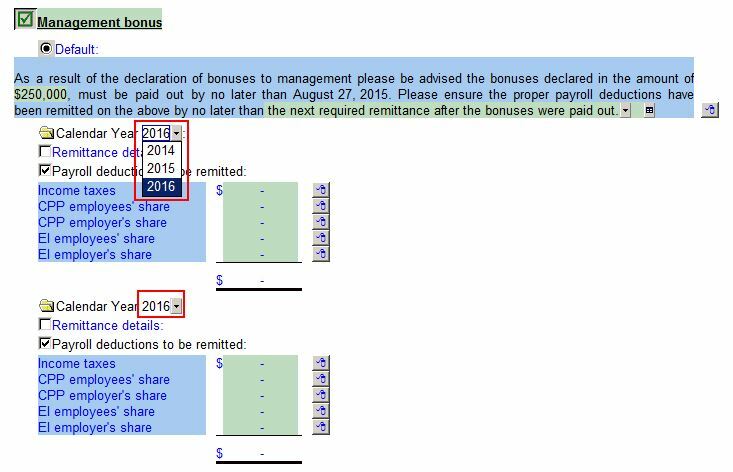 Added ability to specify applicable year for management bonus. User can also specify the date in which remittances are due on bonus. 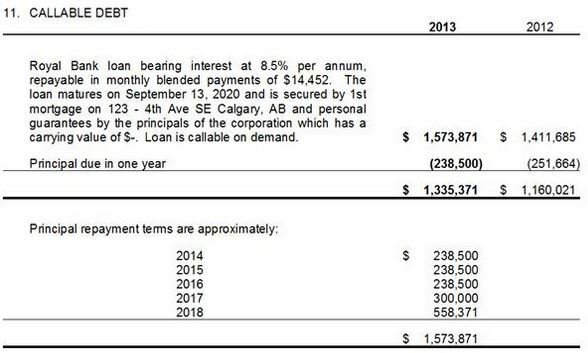 Modified to show the current portion of future lease payments net of interest which agrees to the current position shown on the balance sheet. Modified to report the interest portion of total lease payments for the next twelve months to the lease obligations working paper. 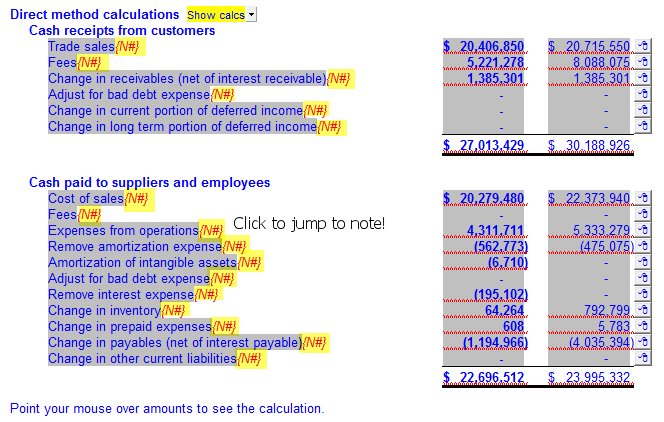 Added two new manual lines with underlining and print/skip switch in the "Cash Flow Supplementary Information" section. Jazzit has released an update for Jazzit Fundamentals on June 26, 2015. Also check out our new video on Jazzit Support Resources! Added a visual compare option when "Update section from Resource Centre" is selected in the express button menu. 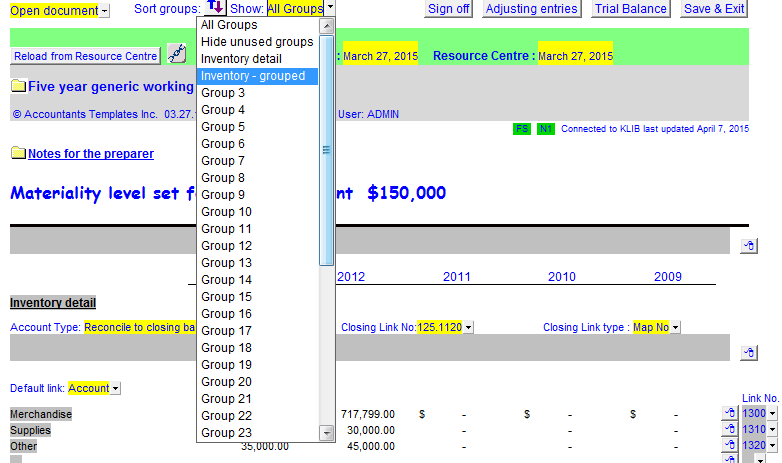 This provides the user with a comparison of what is currently in the client letter, versus what is in the Resource Centre (located in the lower window pane). Summary of specified foreign property can now be sorted either manually or by country code. Once it has been sorted by country code, you can also add in subtotals as desired for each country using the "Insert subtotal" express button menu option. 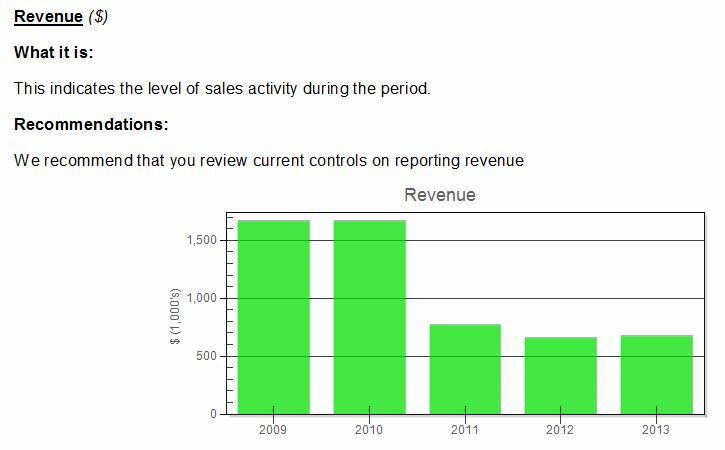 Added a table for adjustments to total revenue. Users can now insert either manual or linked lines into this area. Updated express buttons for long term assets and liabilities to allow switching section heading on/off. By default, it will switch on when indented and off when set to no indent. Added the ability to display paragraph on/off switches to all additional letters. 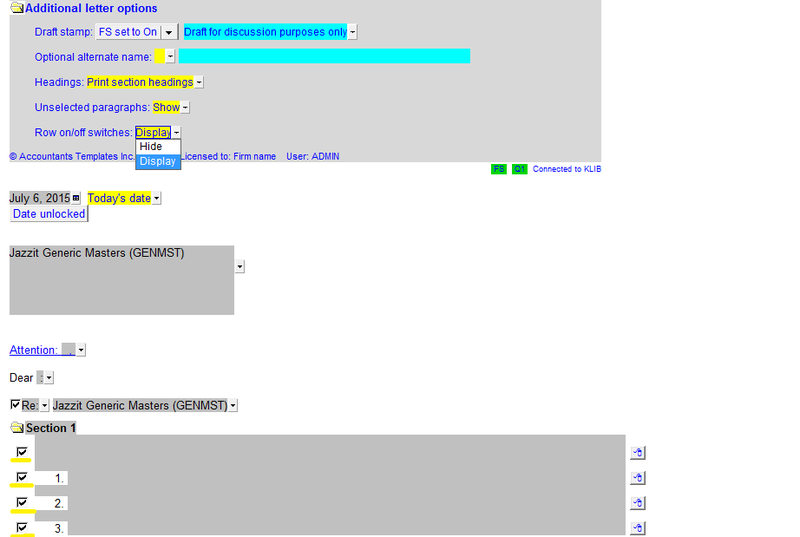 Inline Diagnostics have been added to the generic checklists. Added support for zero and one decimal point for 2 year EBITA amounts. All CRA remittances that are not attached to a return now to go one address. Jazzit has released an update for Jazzit Fundamentals on May 29, 2015. Added new format option for Partnership to show partners in columns rather than rows. Note that partners must be setup as entities in order to use this format option. The layout is similar to the existing NFP format B. Added right mouse menu to CY and PY % in revenue and fees section so user can adjust the amount +/- .01 for any rounding differences so section will total 100.00. Added new option under page options for "Earnings or loss". This will switch between earnings and loss (rather than income and loss) depending on balances for current and prior year(s). Added the Express button option to show/hide print/skip checkboxes on each paragraph within the letter. This allows you to turn on and off paragraphs for each section as desired. There is also a global switch in the template options area to show/hide all row checkboxes. 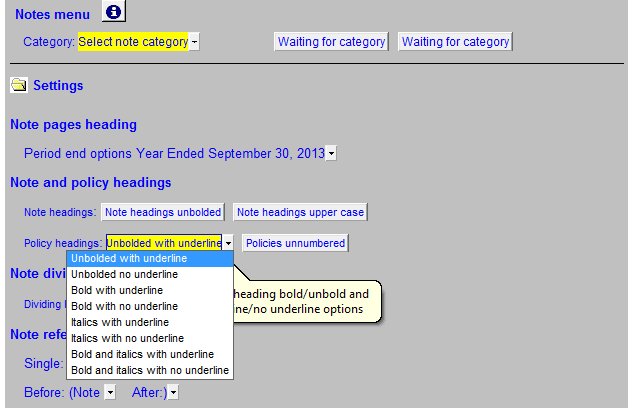 Added option to edit the header wording for note pages within the settings section located at top of the notes. Increased the number of paragraph groups from 10 to 30. Added option to sort paragraph groups in the freeze frame. Added option to hide unselected paragraph groups in the document options area. Added the option of "For the..." in the date cells of all 20 schedule headers for consistency of options with the statements. Added option to select province from the template options. The appropriate act will automatically be displayed based on which province is selected. The federal tax is now no longer netted against provincial tax. 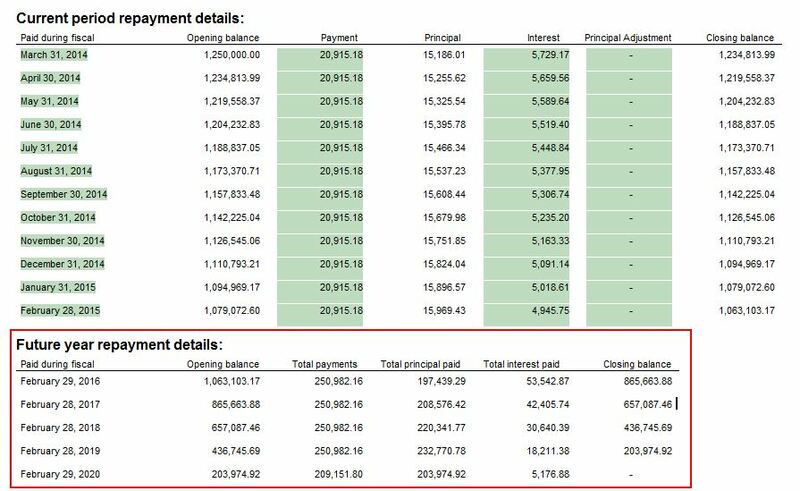 It is now possible to have both income taxes payable and receivable on the balance sheet (for example if federal is payable and provincial is receivable). Added a warning at top of statement of RE when PPA switch is off and PPA adjustments are present. 2x click on the warning to open the PPA section. Added print/skip switches to all rows that cannot already be skipped (via link dropdown cell) in the direct method calculations section. Template has been redesigned to provide required information for the quick method of accounting GST/HST form. Correction made to the NTR report so it will maintain the indented position when updated from Resource Centre. Jazzit has released an update for Jazzit Fundamentals on April 23, 2015. 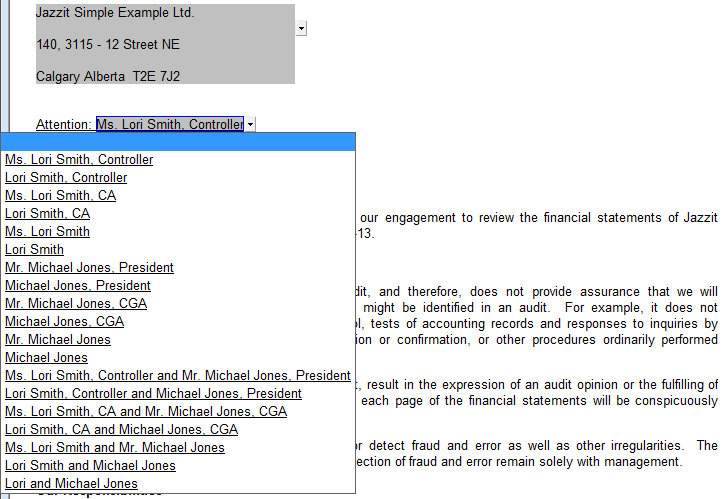 We have added a customizable letter which is from your client addressed to your accounting firm. This is the opposite of the existing blank additional letters. 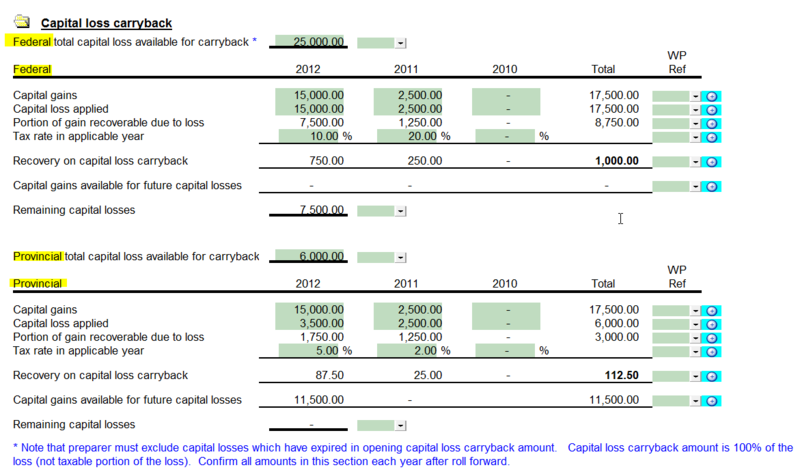 We have added a "Summary of loss carried forward" table to the working paper. We have also increased the decimal points from 2 to 3 in the GRIP section. We have added tables to show the aging of loans and loan impairments to the notes linked to the trial balance and Jazzit working paper. 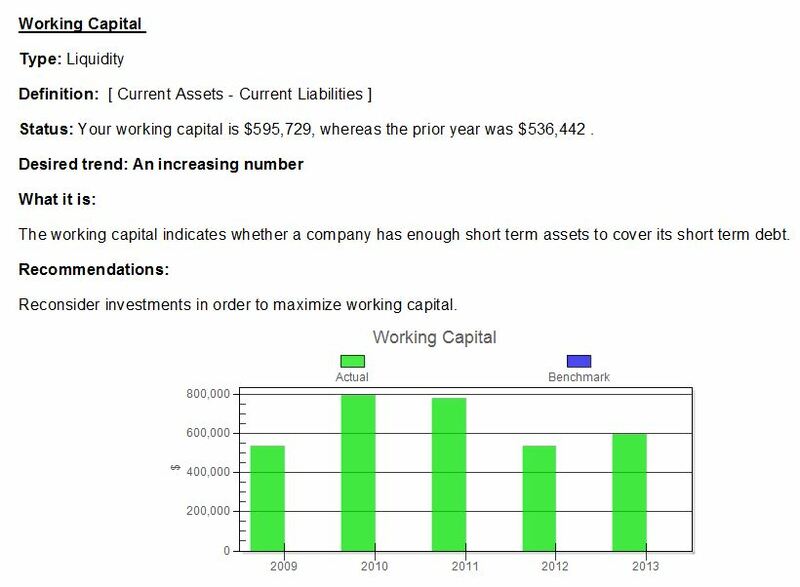 We have added a PPE note which allows you to detail additions and disposals to capital assets. By default, the note is linked to your Jazzit working paper. 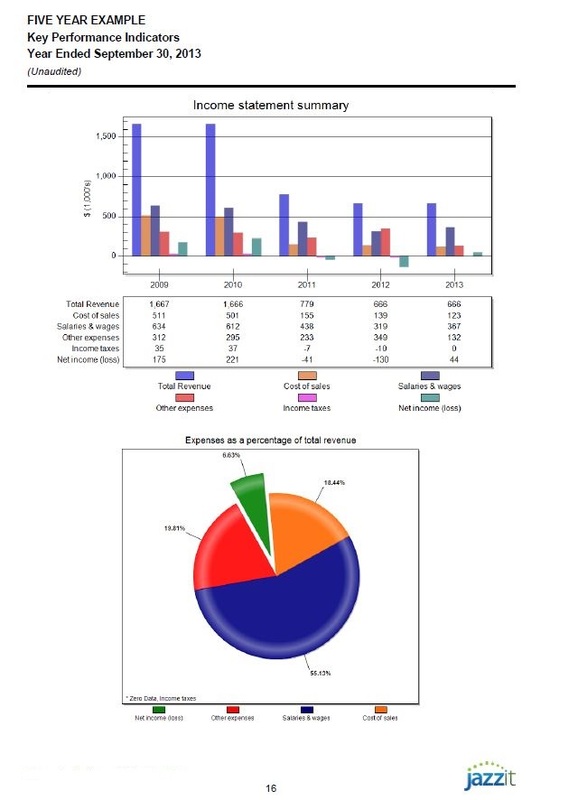 We have increased the number of available bank reconciliation working papers from 1 to 5. We have increased the number of available groups from 10 to 40. We have also added the option to display a particular group in the freeze frame. Jazzit has released an update for Jazzit Fundamentals on March 27, 2015. 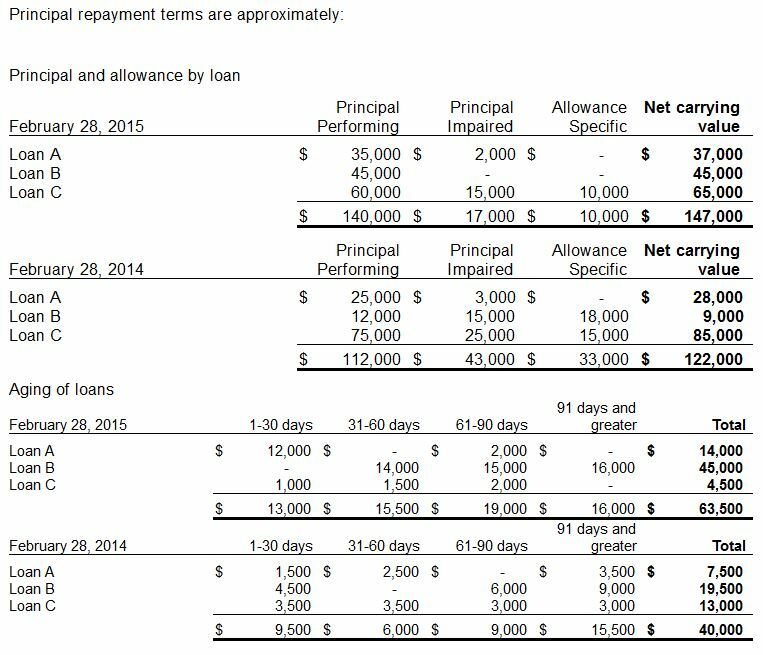 Added support to provide compounding interval, payment interval, and loan type (blended, interest only, and principal only) information to the related debt notes in the financial statements from the loan calculator. 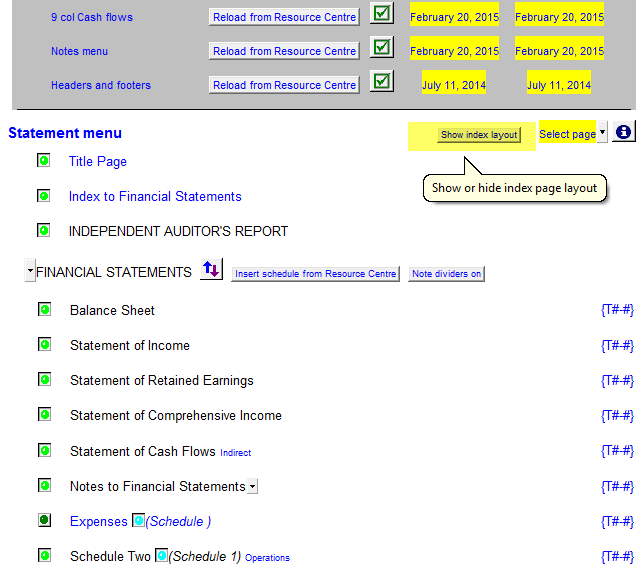 Home menu at the top right now indicates if financial statements are properly linked to the Resource Centre and when the administrator last updated the Resource Centre. Two signature lines can now be placed either one below the other, or side by side via a dropdown in the signature area. We have added the ability to specify the country code for securities marked as specified foreign property. Increased the number of available groups from 10 to 40. Also added the option to display a particular group in the freeze frame. Updated to reflect the 2014 CPEM wording revisions for review engagements. The sample report is now indented and we have added the option to skip report heading and signature block (both set to skip by default for review and audit engagements per CPEM samples). 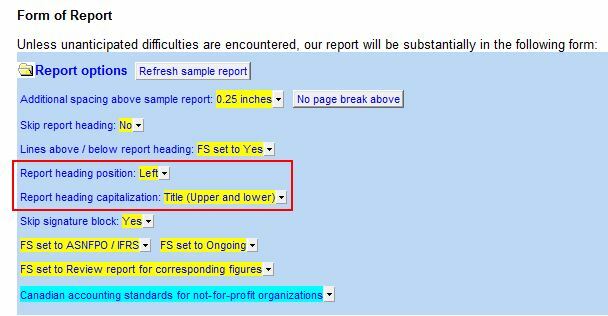 We have also added the option to bold or unbold the section headings in the sample audit report. 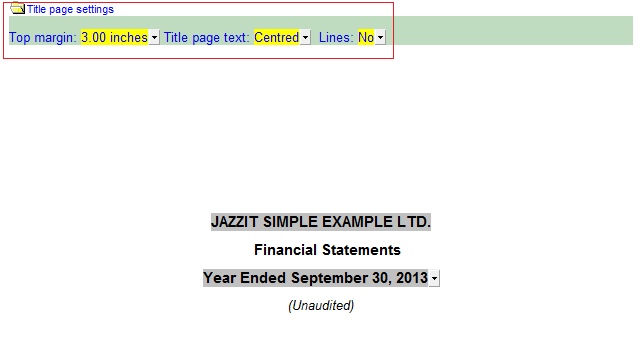 Document maps have been added to Jazzit working papers and letters to assist with navigation. Quickly get to the section you want by using the document map panel. Top right corner (below the license information) now indicates if properly linked to the Resource Centre and includes diagnostics to help troubleshoot if Resource Centre is not found. Visit CPA's website for more details. 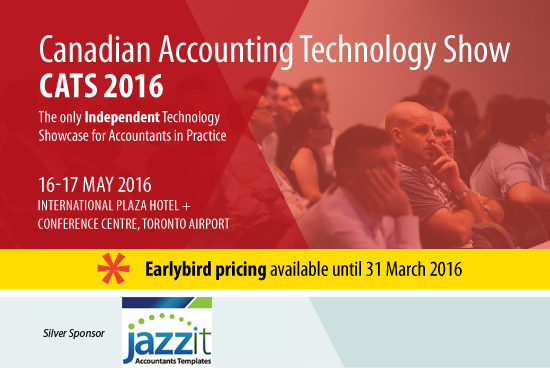 View the CPA full conference agenda. In this outstanding keynote presentation global innovation guru and bestselling author Robert Tucker will discuss his research into the essential best practices of the world’s leading companies. You’ll learn cutting-edge strategies from firms that are using Tucker’s principles to turn innovation into a powerful source of growth, profits and competitive differentiation. There are important new methods for making innovation a systematic process and you will learn proven methods to implement a superior approach to innovation – one that will enable you and your organization to enter new markets, win and keep new customers, and grow revenue from new sources. Tucker will explain how you can master new ways to motivate your team and cultivate a culture of innovation where innovation is everybody’s business. Check out out new Jazzit Diagnostics Report video! 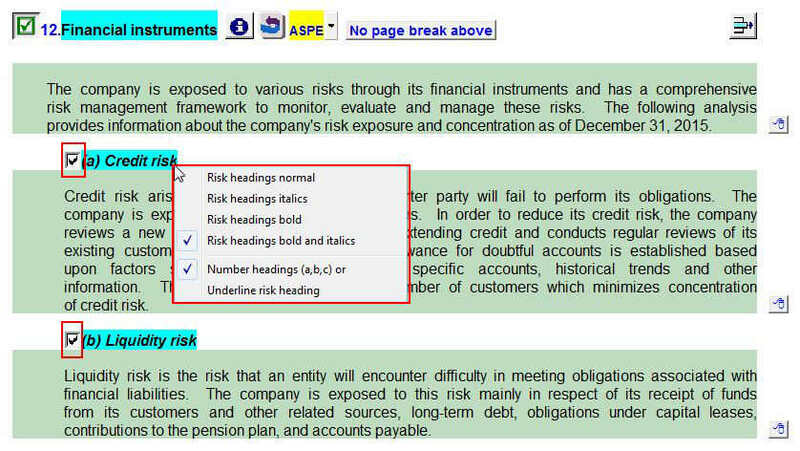 We have added a new setting which allows significant accounting policies to be displayed with letters. There is now also the option to have bold without underlining. 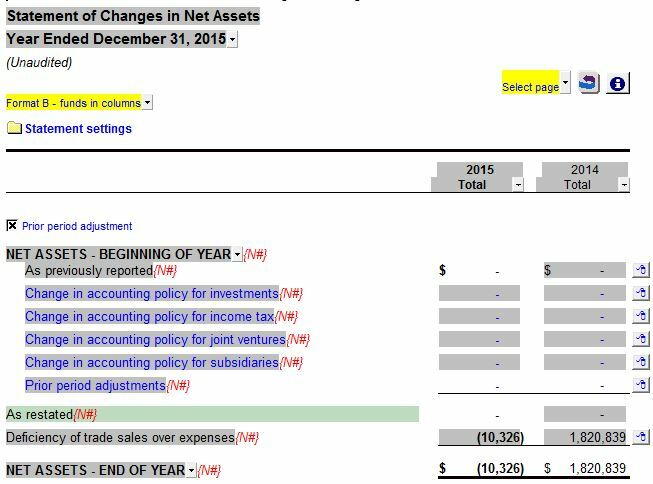 We have added a separate column selection for Net Assets Format B in the 9 column Income Statement. 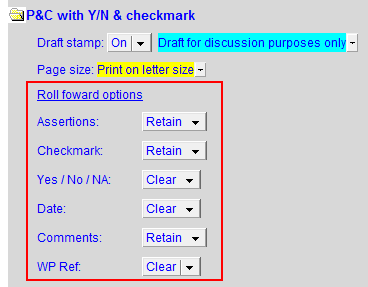 Note that the format will default to the main statement column selection panel if nothing is different. Now if the note is set to "Cost", Fair Market Value is now shown in the line items. 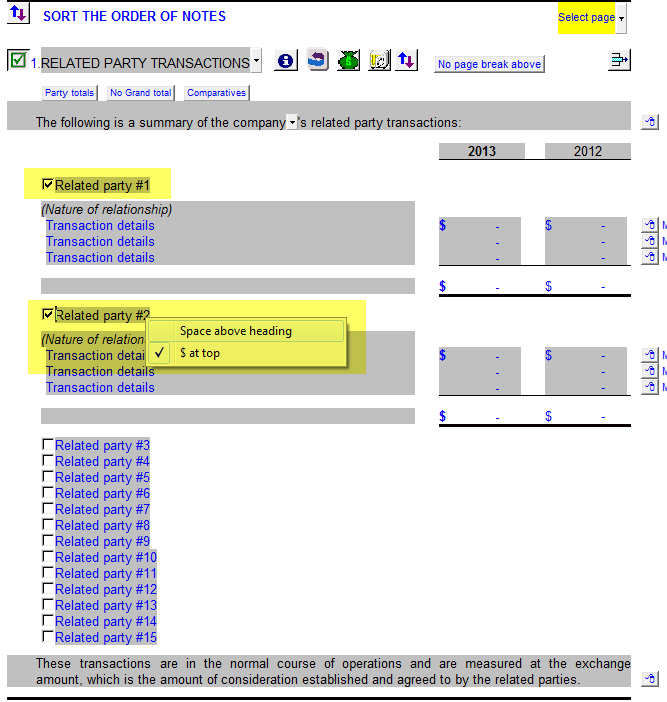 Individually select related parties in the Related Parties Transactions area. We have added page break options in the express buttons of all input paragraphs. Congratulations to Austin Nieuwdorp, the winner of the Jazzit CA Student Recognition Award! Austin has been involved with KidSport Calgary for four years. KidSport Calgary is a chapter of a national organization which strives to provide funding for low income families to enroll their children in sport. The committee Austin is a member of has raised annual funding levels per child to $400. This has resulted in enrollment increasing by more than 15% since last year. Austin is being awarded for his dedication to these causes while his free time was extremely limited due to his studies. Keep up the great work Austin! Congratulations to Manik Sethi, winner of the Southern Alberta Insitute of Technology - Jazzit Award for 2014/ 2015. This award is available to a second year student enrolled in the Business Administration / Accounting program. It is awarded on the basis of the most academic improvement between semester I and semester II of the program. 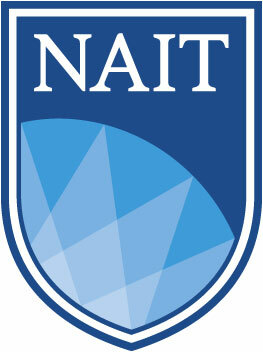 Congratulations to Satnam Singh, the winner of the Northern Alberta Institute of Technology - Jazzit Award for 2014/2015. This award is available to a second year student enrolled in the Business Administration / Accounting program. Awarded on the basis of most academic improvement between semester I and semester II of the program. Remember to check out our 9 Column Implementation Video! A new format option has been added, which enables users to select between the regular balance sheet presentation and the PSAB (Public Sector Accounting Board) presentation. This is available for both classified and unclassified options. Structure is set to Not-For-Profit. 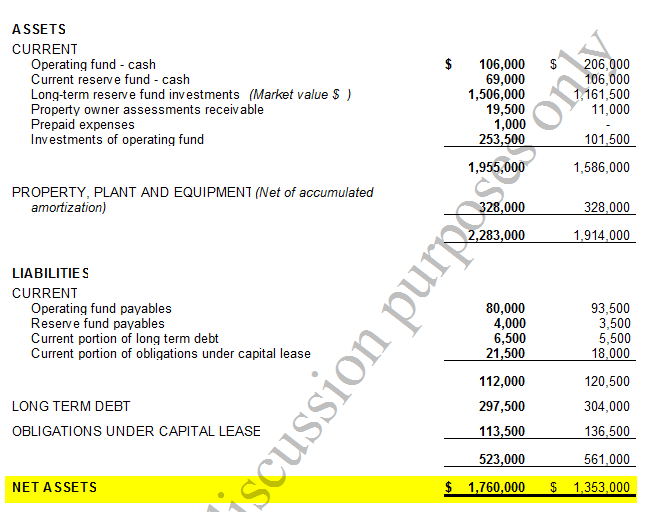 Format C is selected in the net assets statement. 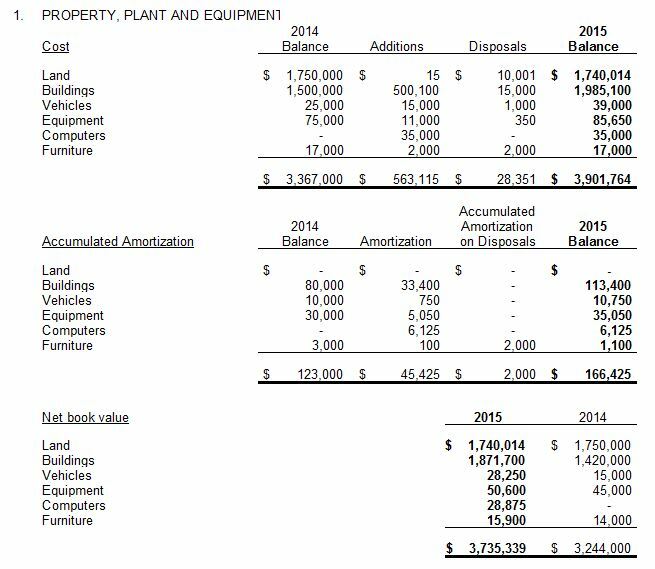 Only the Current Year and Prior Year columns are selected in the balance sheet. Added an optional description for the subtotal after fees. For it to appear, the subtotal must be set to print, by the switch to the far right of the line. Added note references to all lines in the direct method calculation. Click on the note reference to jump to the corresponding note. 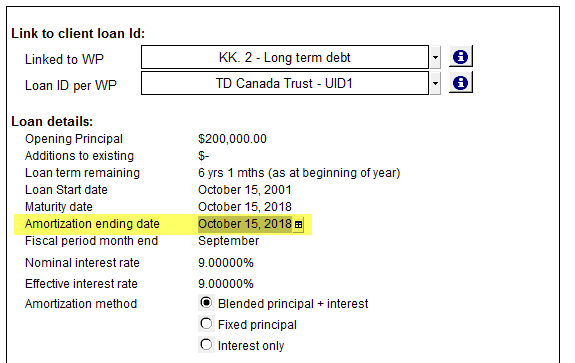 Added the ability to specify a loan amortization period which extends beyond the loan maturity date. A warning has been added if the amortization period is prior to the maturity date. Added "Title of Owner(s)" and "Number of Owner(s)" to the letter options. 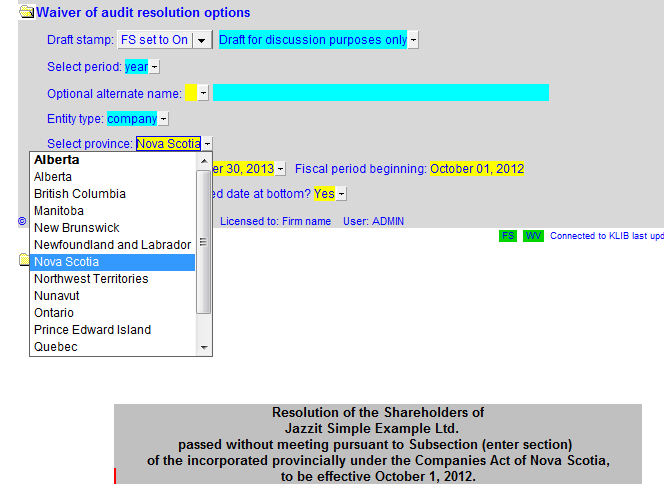 Also added requested single/plural shareholder wording. Added the ability to change the tense of the default description of business note. Also added the ability to date when the company was incorporated. 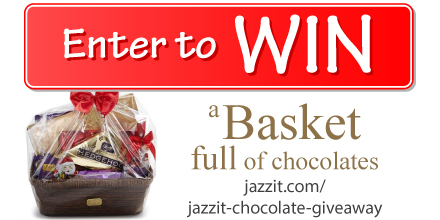 Chocolate lovers – learn about how to WIN a Purdys basket of chocolates.